Approximately 100 seeds in 0,5g packet.A mixture of several varieties of basil differing in color an..
Aromatic, deep red-purple leaves, wonderful to add color to salads, pasta and pizza. A colorful addi.. Some common names for this perennial include gas plant, burning bush, dittany, and fraxinella. They .. Neon is a variety of Calendula which is a member of the Pot Marigold family. Its botanical name is C.. Annual up to 60 cm high.Flowers orange with black centers from May to October.Incredibly easy and re..
Easy to grow blooms with a deep red reverseIncredibly easy and rewarding to grow, soft apricot flowe..
Easy to grow, enchanting creamy white flowers flourish over finely cut foliage. Lovely in annual bor.. The large orange double or semi-double flowers of "Rosebud Orange" are similar to the blooms of rose.. The graceful multi-stemmed habit of shadblow serviceberry, white spring flowers, edible summer fruit..
A large evergreen plant with dark green, arching leaves atop a massive trunk, Canary Island date pal..
No cottage garden should be without tall snapdragons. The beautiful red color in this blend will.. The graceful multi-stemmed habit of shadblow serviceberry, white spring flowers, edible summer f.. 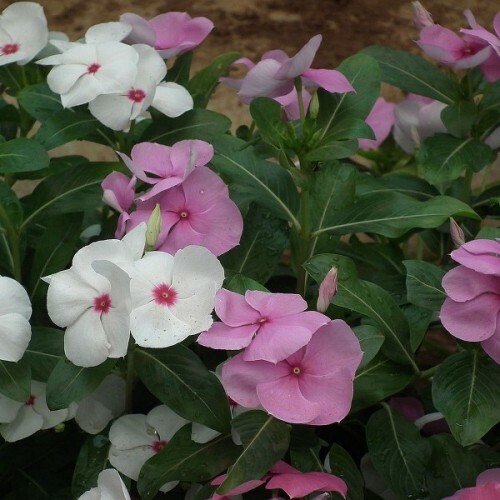 The Madagascar periwinkle is a pretty blooming plant with plenty of silly scientific nonsense go..